Over the last couple of years the idea of “boys toys” and “girls toys” has been part of a topic of conversation, especially when it comes to gender identity. Major retailers like Target have chosen to remove the idea of a “boys” and a “girls” section of kids’ clothing in favor of simply a “kids” section. Now, we attempt to stay out of politics here at TokuNation because we like to see ourselves as a way for people to allow themselves a distraction from something you’re likely seeing or hearing about in the 24/7 news cycle however we felt it necessary to bring this portion of conversation to light. A few years ago we wrote an article regarding a quote from a Hypable story where it was stated that there was pressure in Power Rangers to NOT feature or release girl action figures because Power Rangers is a boys action figure line. That story, for us at least, went viral on social media, reaching nearly 50,000 people on Facebook alone. Bandai America reacted quickly in the convention circuit and announced that girl action figures (and girl Ranger Keys at the time) were coming and that they were not going to cut the girls out of the line. At this year’s New York Comic Con, Bandai America openly stated to numerous fans in attendance that in the future they would be decreasing the number of girl action figures available in the various Power Rangers toy lines due to the fact that they’re not selling. And, in all honesty, they’re right – shelves are full of Power Rangers Ninja Steel White and Pink Rangers (and Yellow, because Yellow has traditionally been female) and the 6.5″ Legacy line of figures are swamped with Ninja Storm Blue, Mighty Morphin Pink, Mighty Morphin Yellow, and In Space Yellow figures. Recently, our friends at Power Rangers NOW revealed the press photos of the upcoming figures in the first assortment of Power Rangers Super Ninja Steel. Missing from the line up are any female action figures. 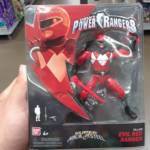 Our site sponsor BigBadToyStore.com put up a pre-order for Wave 4 of the 6.5″ Legacy Power Rangers figures. The case assortment does not contain the two Mighty Morphin female Power Rangers (Pink and Yellow) and instead opts to double up all the male figures. Bandai America has stated themselves and used the YouTube channel MMPRToys to tell fans and collectors that if they want to see the new figures they need to buy the female figures. The quote from Bandai America at New York Comic Con is that the Psycho Rangers, a fan-demanded line of figures from Power Rangers In Space due out (originally) in late 2018, are ready to ship but won’t because female figures are clogging the shelves. This is correct though horribly stated. In order for new toys to ship out to stores, the old toys have to sell first. In this instance, the female figures are the leftovers from the older waves, and would need to sell first before the new wave releases. Hence, “buy the girl toys or the new toys won’t come out”. In a world where Wonder Woman can be a dominating box office presence and an inspiration for young girls everywhere, we challenge both Bandai America and Saban Brands to do more to empower the female characters in Power Rangers to make them more desirable to all fans, young and old, boy and girl. Instead of being side characters to fill out a roster, do more to flesh them out so everyone will want a representation of that character in their collections. Power Rangers has always been progressive, featuring strong lead roles for so many different ethnicities in times where white skin males made up the majority of superheroes. In a world where discrimination against women continues to rock headlines, Power Rangers once again can be a pioneer in equality if it chooses to be. However, with Uchu Sentai Kyuranger looking more and more likely to be the next adaptation of Super Sentai, a team that features 12 total heroes with only 2 of them being female, we may have to wait 3 years or more for that to happen. On the plus side, the official comic book Mighty Morphin Power Rangers, published by BOOM! Studios, has revealed that there was an original team of Rangers before the teens we knew – and they featured a female Red Ranger (along with a Pink male Ranger to boot). So while the collectible side of things seems to be highly male-skewed, we have to give credit where credit is due to both Kyle Higgins, writer of Mighty Morphin Power Rangers, and Saban Brands for approving these stories and adding more depth and diversity in to the history of the Power Rangers. But what does the future hold for the Power Rangers toy lines? Are girls really diminishing from the toy line? And is that a bad thing for a brand geared towards boys? And can we blame Bandai for decreasing the number of toys that don’t sell (that just happen to be female)? Or do we blame Bandai and Saban Brands for not marketing their female characters in a more appealing way for kids and collectors alike? Join in our discussion. Credit @heroheroherotoys on Instagram for the story title image and @willyjcoe on Twitter for the additional image. 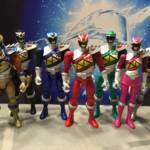 As of the time of this update we have had zero response from Bandai America or Saban Brands regarding this article. We welcome the opportunity if they’re interested. Our final gallery from this year’s Toy Fair 2017 is the assortment of upcoming Power Rangers Ninja Steel merchandise. Check out new images of the following items! 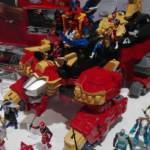 Click the title of the story to view the images – Toy Fair 2017 – Power Rangers Ninja Steel! Stay tuned for more information when available from Toy Fair 2017! BigBadToyStore.com Sponsor Update – Legacy Power Sword and More! Our site sponsor BigBadToyStore.com has sent out their newsletter and with it comes the first pre-order and estimated release date of the Mighty Morphin Power Rangers Legacy Power Sword! Check out all the details (new pre-orders and new arrivals) below! For some of the best customer service around, check out our site sponsor BigBadToyStore.com! Don’t forget to use the “Pile of Loot” shipping method saving you potentially hundreds of dollars in shipping costs! Check out the full newsletter by clicking “Read More”! The Nuremberg Toy Fair 2017 has ended. Many times there will be booths closed to the press. Two images were recently shown via The Euro Nerd Facebook Page, where we get our first look at the upcoming Power Rangers Ninja Steel Lion Fire Fortress Zord. This thing is MASSIVE – is estimated to cost over $100, and features many play styles for both your 5″ Power Rangers Ninja Steel figures as well as the actual Power Rangers Ninja Steel Megazords as well. Check out the image! Be sure to check the full video below. Support MMPRToys by subscribing to their channel and watching the video through to the end. Join in our discussion linked to the story.